A colorfully decorative slow- and low-roasted salmon dish that’s perfectly moist and celebrates easy cooking and food as art. I like to call this Herb Roasted Salmon dish salmon art. I mean….just look at it!!! It’s a let’s-have-fun-playing-around-with-all-sorts-of-seasonal-toppings-and-types-and-colors-of-citrus kinda dish. If it’s a citrus it can go in this salmon dish! The sky’s the limit as far as toppings go. And ya know I’m a use-what’s-in-season kinda gal. You can flavor that oil with whatever you fancy: spices, herbs, citrus, chilies, garlic, shallots, onions, and so on, which in turn will flavor the fish. The toppings will permeate through the oil to flavor it while the fish cooks so just choose wisely (and play and experiment). 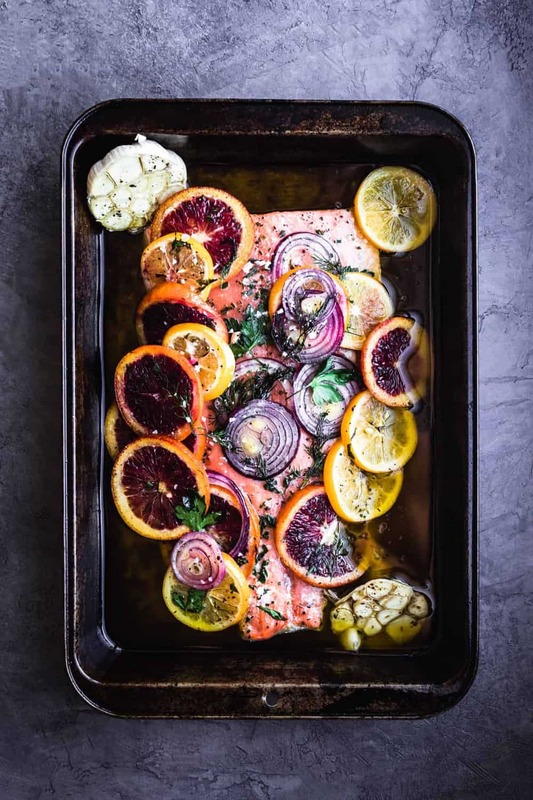 This roasted salmon is inspired by this Alison Roman recipe I first saw in the NY times and is all over the internet…and for very good reason! 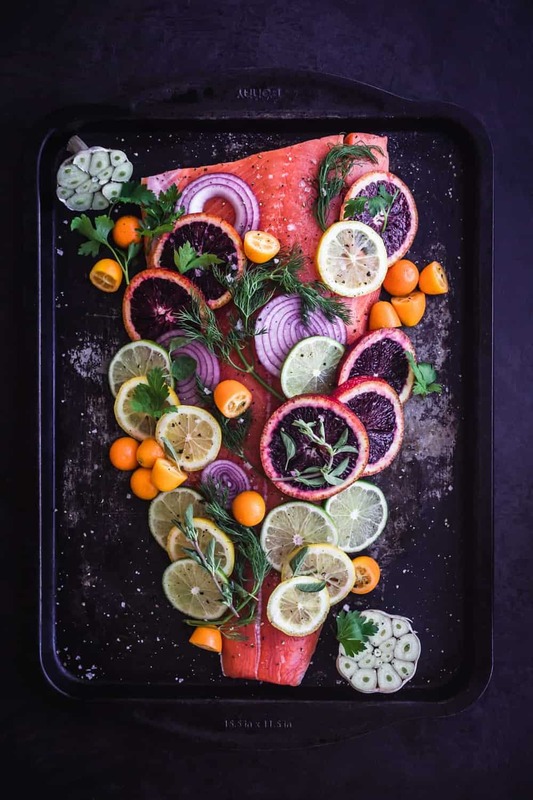 This easy-to-prepare, make-ahead-of-time salmon has become a staple of mine, especially for dinner parties, where it can beautifully take the place of the table centerpiece. The salmon cooks perfectly each and every time. It’s the magic combo of cooking a naturally oily fish in lots of oil at a low temperature. And don’t be alarmed at the amount of oil in here…it’s the key to keeping the fish beautifully moist and I pour a lot of it out before serving. Fail proof: Slowly roasting an already fatty fish in generous amounts of luxurious fat (olive oil) makes it nearly impossible to overcook and the result is a tender and moist salmon. Adding fresh citrus adds bright vibrancy to this succulent fish. The toppings are versatile and easily adaptable to every season so we can enjoy this salmon all year round. 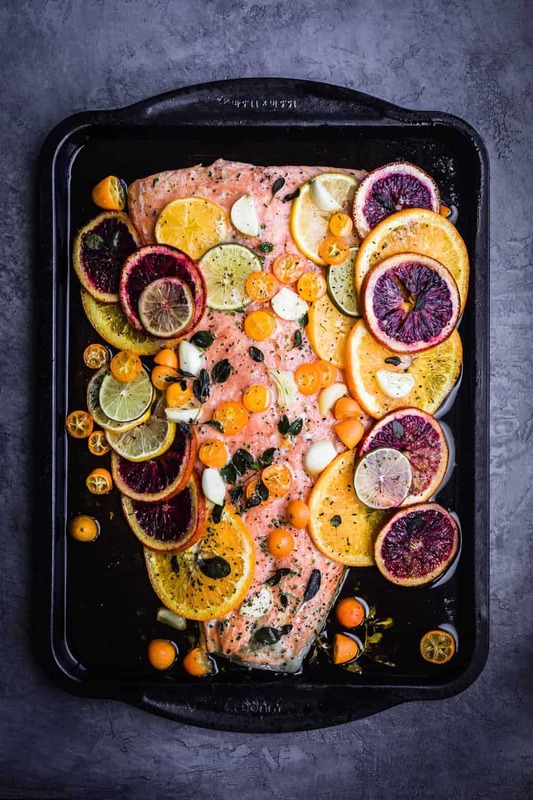 The salmon dish falls at the magic intersection of low maintenance and looks highly impressive, making it perfect for entertaining or easy, weeknight meals. This salmon can be dinner even on nights when you didn’t think you had time to tackle seafood! 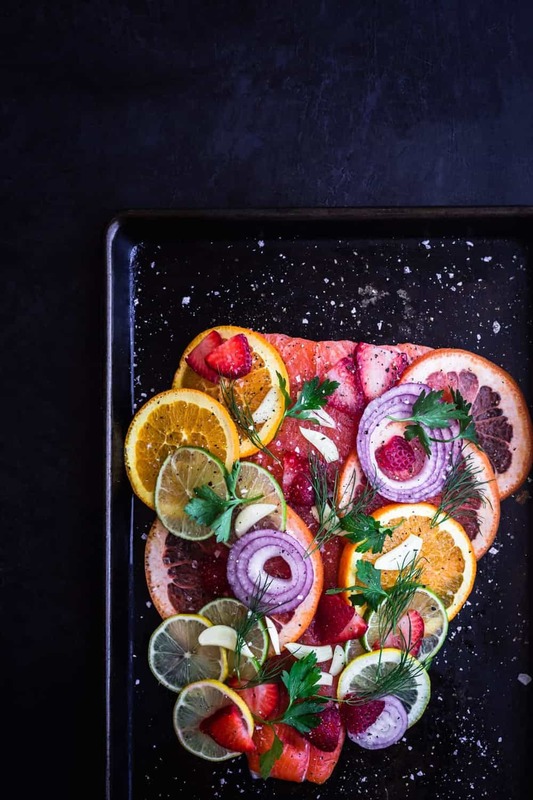 Decorate salmon with fresh citrus, herbs, and whateva else your hearts fancies (see my pics for inspiration). Salmon is readily available, extremely versatile, and simply delicious. 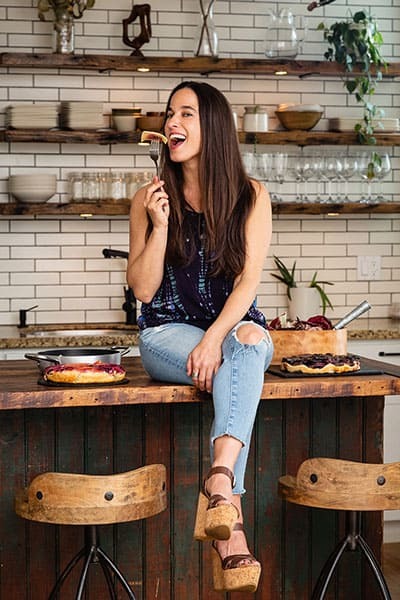 Get playful and creative when choosing your toppings, though it’s also alrighty to keep toppings to a minimum and super simple. Pieces of fish commonly tend to vary in thickness so keep in mind that cooking times will vary as well. Buy wild salmon over farm raised when possible. It tastes better, has firmer, fattier meat and is better for the environment (in moderation). Store any leftover salmon in the remaining oilto keep it from drying out, good for up to 3 days. This dish is pretty enough to WOW as the as the centerpiece of your table! I even went wild for my summer pop-up and added strawberries. When in season I say…! I haven’t tried this method with another kind of fish yet but you surely could, especially with other fatty dishes like halibut and cod. 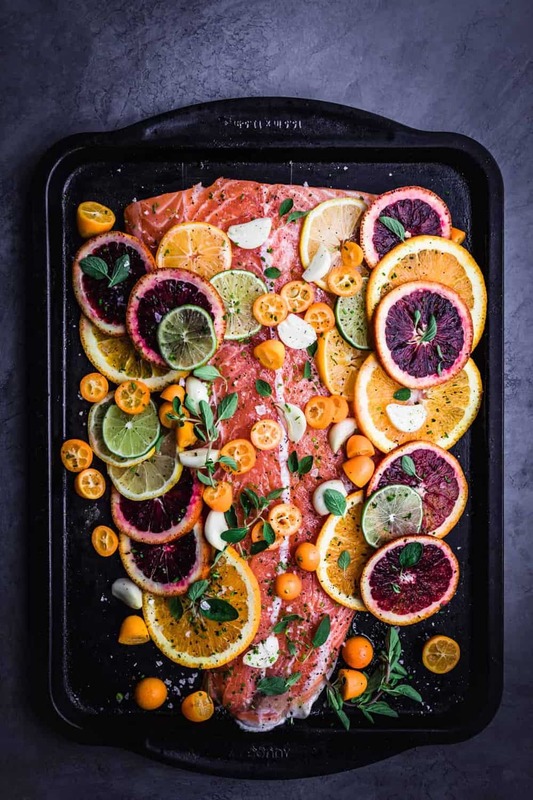 A colorfully decorative slow-and low-roasted healthy salmon dish that’s perfectly moist and celebrates easy cooking and food as art. Dry salmon with a paper town, season both sides with salt and pepper and place on a large baking dish. 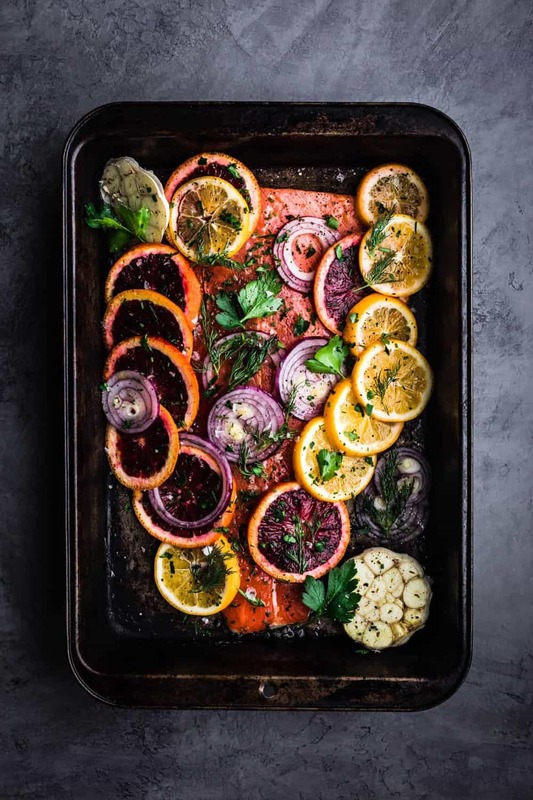 Decorate salmon with citrus slices, onion rings, sliced garlic, herb sprig and half of the fresh herbs. I have way too much fun with this part and hope you do too. Drizzle salmon and all the fixings with olive oil. Season with a bit more salt and pepper. Bake 25-35 minutes, until salmon is just barely cooking through and turning opaque around the edges. Exact cooking time will depend on the thickness of your cut. Transfer salmon to a serving platter (or enjoy straight from baking dish but may want to pour some of the olive oil out if you choose to do so). Sprinkle the remaining half of the fresh herbs on top and enjoy. Store any leftover salmon in the remaining oil to keep it from drying out, good for up to 3 days. Yes! I’ve made this for you :). Thank ya! This is gorgeous! And I bet it tastes as good as it looks! Thank ya so much! And I must say that it does :). If ya make it pretty please take a pic…I’d love to see! If I could give this one 10 stars I would. This is my go-to salmon recipe. Make sure you get good salmon as the flavors are perfect. My kids dont typically eat fish and they wolf it down. When I make this, I make double what I usually buy for fish as everyone eats so much of it. Reading your comment just made my day!!! LOVE IT! So happy to hear Orlee and thanks so much for the feedback! Loved it!!!!! My family was very impressed with my gourmet salmon! Thanks for sharing!! Absolute pleasure!!! Thank you so much Raquel for the feedback :). ?? Wow, I love this, delicious and tempting, Thanks for sharing!! Absolute pleasure!!! Please let me know if ya make it :). We just had salmon for dinner last night. I will print and save this for next time round. Looks delicious. Love the flavour combination. Thank you so much Gloria! Super stoked you want to make this! And please let me know how it goes after…. I’d absolutely love to hear :). Beautiful!! This is absolutely a dish I would want to make when I have company coming so I can impress them with this beauty. Thanks so much!!! Super stoked to hear that :). I like to think of this dish as salmon art! Please let me know how it goes after ya make it… would love to hear. That is one gorgeous meal! I love salmon and enjoy serving it to guests. 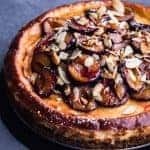 This truly will wow them not only because it is beautiful but it looks so delicious! Thank ya so much Elaine! Love salmon too and this will def wow your guests :). Thanks for the feedback! Love all the herbs you have combined to make this salmon pop! I love a good salmon recipe and I think I have found my new go-to. Yessss!!!! So stoked to hear that Des! 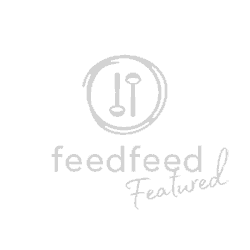 It’s a great dish for entertaining and can be assembled ahead of time and then just popped in the oven. And I have so much fun with the seasonal citrus and herbs on top! Please let me know how it goes after ya make it… would absolutely love to hear :). what a great way to celebrate the citrus season! Not only it looks gorgeous, but I’m sure it tastes absolutely amazing! This is certainly a work of art. I love how it looks and I bet it tastes even better. 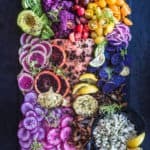 The pink of the salmon with the color of the fruit and onion. We will only buy wild-caught. Otherwise the pink of the salmon is artificial. I can’t wait to make my own work of art. Thank ya so much Marisa! Yes it’s salmon and I like to think of this dish as salmon art! Agreed on wild caught salmon too :). This salmon looks so good. It’s the perfect use of winter citrus for a light dish. Can’t wait to try this. So stoked to hear Sharon! That’s exactly the winter citrus idea :). Please let me know how it goes when ya make it ~ would absolutely love to hear! 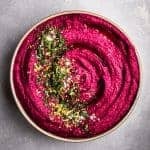 I’m all about more plant and seafood based meals these days so this one is going on my need to make list ASAP! We’ve been getting all the citrus we can lately. This is definitely up next on the list. Can’t wait! 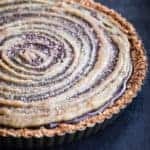 This sounds delicious and your photos are absolutely stunning! Love that dark, moody backdrop against the bright citrus fruits. Thanks so much Claire!!! Really appreciate the feedback :). And I love thinking of this dish as salmon art! Such beautiful pictures and lots of freshness going in this recipe. Herbs, lemon and oranges, my favourite! Yes exactly! That’s the idea with this salmon dish :). Thanks so much for the feedback Jagruti! Thank you so much Jyothi!!! I like to call this dish salmon art. Love and appreciate your super sweet feedback so much :).